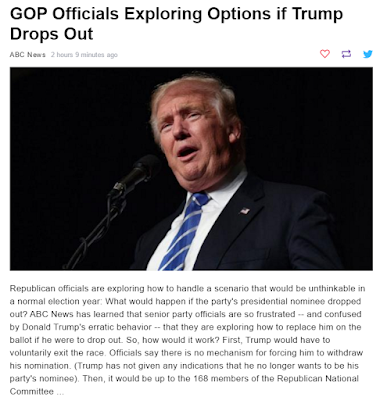 DemoCurmudgeon: Republicans hoping Trump Drops Out!!! Lotsa luck. Nope, the radical tea party right wing shift of the Republican Party hasn't created any problems whatsoever. The funny but tragic thing is; conservative voters haven't really noticed that problem. In fact, they have embraced Trump as their leader. They're all looking for a handout from government leader Trump, who has promised to take care of them and make the US great again.